Charles Edward Gepp was born in Springfield into the Gepp family of solicitors. Part of his education was at Chelmsford Grammar School. He joined the army in January 1916 and landed in France in March 1916. He killed in action on the first day of the Battle of the Somme in July 1916. His home was at Coval Cottage off Rainsford Road. Charles’ battalion, part of the 168th Brigade in the 56th (1st London) Division, participated in the opening of the Battle of the Somme, moving up from Bayencourt to Hébuterne on 30th June 1916 ready for the following day’s assault on the German-held village of Gommecourt. It was part of a diversionary attack aimed at confusing German forces as to the location of the main Somme advance, which as further to the south-east. By that time Charles was one of about 50 survivors from the original battalion that had arrived in France in September 1914. By 4.30 a.m. on 1st July 1916 Charles’ battalion was in place ready to lead the assault which began at 7:30 a.m. after heavy artillery fire from British guns. The battalion, on the right flank of the attack, advanced strongly towards Rossignol Wood, almost reaching their pre-arranged rendezvous point with the 46th Division beyond Gommecourt. However, they were driven back by field artillery firing through the gap between Rossignol Wood and Gommecourt Wood, together with machine gun and rifle fire from the same direction. By 9:15 a.m. casualties within the battalion were at over 40%. Although the German front line was reached, by evening the survivors had been forced to withdraw back to British lines. The positions of the respective armies were to remain unchanged in this area for the following four months, and it was not until February 1917 that British troops were to set foot in Gommecourt, following a voluntary German withdrawal back to the Hindenburg line. The 56th (1st London) Division suffered over 4,000 casualties in the attack - 1353 men killed, 2355 wounded, 233 prisoners, and 373 missing. Among the latter was Charles who was later acknowledged to have been killed in action,. He was one of more than 20,000 British soldiers to die that day in the Battle of the Somme. He had served for 163 days, of which 59 were in France. His death was not officially assumed by the War Office until January 1917. Charles was born at Springfield Tyrells in Springfield on 4th August 1898, the son of the lawyer Charles Bramston Osborne Gepp and Elizabeth Mary Gepp (nee Clarke). His father had been born on 30th October 1839 in Chelmsford; his mother in 1870 in Earl’s Colne. They had married in Melcombe Regis, Dorset on 23rd September 1893. Charles was baptised at All Saints’ Church in Springfield on 8th September 1898. Charles’ uncle Thomas Sydney Gepp had died from wounds received in the Battle of Churpoorah in India in 1858 while serving with the 66th Goorkahs. Charles’s siblings were Dorothy May Gepp (born in 1895 in Wanstead, died 1948), Eileen Lucy Gepp (born in 1896 in Springfield, died 1973) and Kathleen Mary Gepp (born in 1903 in Springfield). 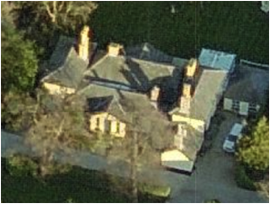 At the time of the 1901 census two year-old Charles was resident with his parents, two elder sisters and four servants at Tyrells, High Road (today’s 250 Springfield Road), Springfield. Tyrells had been built by Charles’ father around 1889 and had eight acres of grounds. Charles’ father, who died in London on 14th April 1907, aged 67 was a solicitor involved in the well established family firm Gepp and Sons of Chelmsford, which had been founded by his great-grandfather in 1768. Charles’ father had followed Charles’ grandfather (Thomas Morgan Gepp) in the office of Under-Sheriff of Essex, retaining it until few weeks prior to his death. Tyrells was sold within weeks of the death of Charles’ father to Mrs. Walter Ridley. Two of her sons - Christopher Mellor Ridley and Herbert Leslie Ridley - were to lose their lives in the First World War while the house was still their home. Just four days after his father’s death Charles joined Form I at King Edward VI’s Grammar School in Chelmsford as a day scholar, having previously been privately educated. His admission papers gave Charles’ home address as Coval Cottage, Rainsford Road, Chelmsford (today’s 19 Valletta Close, pictured). He remained at the Grammar School until 23rd July 1911 when he left Form IV to go to St. John’s College, Hurstpierpoint in Sussex. Earlier in 1911 the census had recorded his widowed mother and three sisters at 21 Norfolk Road in Cliftonville, Kent. His mother made a living through apartments. At the same time the census listed 12 year-old Charles living with his aunt, 64 year-old Ann M. Gepp, and three others at Coval Cottage. Charles attested for service with the Territorials for the duration of the war on 21st January 1916 at Buckingham Gate, Westminster. At time he was still resident at Coval Cottage and aged 19 years and five months. He also agreed to serve overseas. His medical report showed him to be a well-built man. He was, six feet one inch tall, with a 41 inch chest and good physical development. He was immediately posted into and embodied into the 3rd/14th Battalion of the London Regiment (London Scottish) He was appointed unpaid Lance-Corporal on 11th February 1916, and paid Lance-Corporal fifteen days later. On 3rd May 1916 Charles embarked for France. 13 days later he joined the 1/14th Battalion of the London Regiment (London Scottish) and reverted to Private. His new battalion, based in Westminster at the outbreak of the war, had gone to France in September 1914. Charles’ initial service number was 6496, later 512632. During June 1916 Charles spend eight days in hospital suffering from the highly infectious skin disease impetigo. 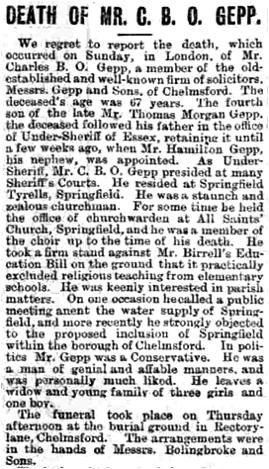 “We learn that the body of Charles Gepp, London Scottish, son of the late Mr. C. B. O. Gepp, of Chelmsford, has been found under somewhat tragic circumstances. In July, 1916, Mr. Gepp was taking part in an advance, and was last seen sitting in the trenches with his head resting in is hands. No definite information as to his whereabouts could afterwards be ascertained, but a few days since the British in re-taking a portion of ground which had been evacuated last year discovered a body with a disc attached bearing Pte. Gepp’s name, and has since been forwarded to his mother in Kent. 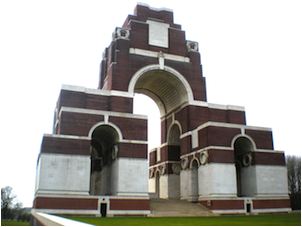 Despite that discovery Charles currently has no known grave and is commemorated on the Thiepval Memorial, near Albert, Somme, France, on the Civic Centre Memorial, Chelmsford and by the Chelmsford Parish Great War Memorial in Chelmsford Cathedral. He was entitled to the Victory and British War medals which his mother acknowledged receipt of on 13th December 1921. In December 1923 Charles’s widowed mother was living with her daughter Kathleen at Cecil Lodge, 21 Norfolk Road, Cliftonville, in Margate, Kent. She had been there since at least April 1917. Charles’ sisters, Dorothy and Eileen, lived at Woodford House, Sleaford, Lincolnshire and The Manor Farm, Nocton, Lincolnshire respectively.